The HK Phil (Hong Kong Philharmonic Orchestra) is one of the finest orchestras in Asia. It has delivered performances of the highest artistic quality and offered music enthusiasts a series of fantastic programmes over the years. Last year, in celebration of the 20th anniversary of the establishment of the Hong Kong Special Administrative Region, and with support of the Hong Kong Economic & Trade Offices, the orchestra performed in Seoul, Osaka, Singapore, Melbourne and at the Sydney Opera House. In January this year, under the dynamic leadership of Music Director Master Jaap van Zweden, HK Phil completed the universally critically acclaimed epic Ring Cycle, taking the orchestra to a new height of artistic excellence. The HK Phil annually touches the lives of over 200,000 music lovers through more than 150 performances including a full-time annual schedule of core classical repertoire and innovative popular programming, extensive education activities and community outreach activities for people of all ages, free concerts including the popular Swire Symphony under the Stars and regular broadcasts and telecasts, as well as collaboration with Opera Hong Kong, the Hong Kong Arts Festival and the Hong Kong Ballet, enriching the cultural life of the Hong Kong community and bringing the joy of classical music to our people and visitors alike. The Hong Kong Special Administrative Region Government is committed to promoting arts and cultural development in Hong Kong and has been providing funding for the nine major performing arts groups, including the HK Phil. This year, we have allocated an additional funding of $55 million to support these nine performing arts groups and other small and medium arts groups funded by the Hong Kong Arts Development Council. We have also injected an additional $500 million into the Art Development Matching Grants Pilot Scheme and have relaxed its matching parameters to encourage donations from the business and private sectors in support of the development of arts groups. However, Government’s efforts alone are never enough. I am pleased to note that the Swire Group in particular has been the Principal Patron of the HK Phil since 2006. I would also like to pay tribute to UOB (United Overseas Bank) for sponsoring the Opening Night. The orchestra also receives long-term funding from the Hong Kong Jockey Club Charities Trust and other supporters of the local community. The enduring support from music lovers and different sectors of the community will certainly continue to propel the HK Phil forward and scale new heights in the years to come. 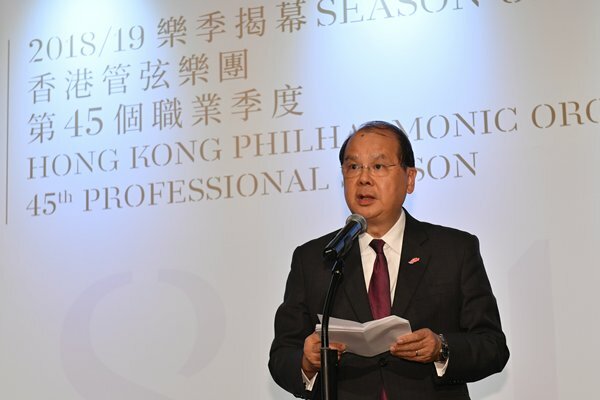 Chief Secretary Matthew Cheung gave these remarks at the Hong Kong Philharmonic Orchestra 2018-19 Season Opening on August 31. 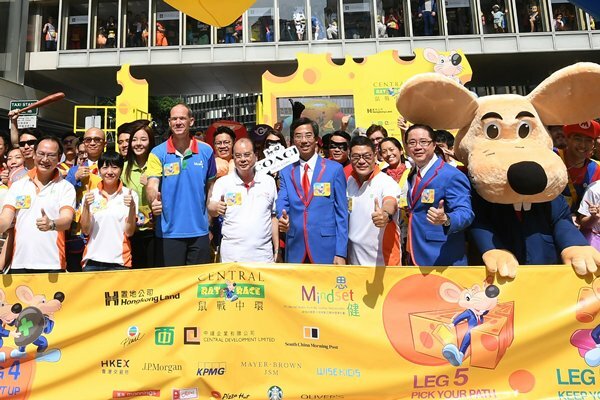 It gives me great pleasure to take part in the CENTRAL Rat Race 2018 organised by Hongkong Land to raise funds for MINDSET to promote mental health in Hong Kong and on the Mainland. Rats usually pose a problem to the Government and our residents. Yet, I am so happy to see so many lovely and kind-hearted “rats” out here today for this good cause. Since its inception in 2006, this fun-filled, festive relay race has highlighted the vibrancy, quality and connectivity of the iconic Central business district, the significance of work-life balance, physical fitness and mental well-being as well as the charitable spirit of the city and its corporate community. To live in a fast-paced metropolis like Hong Kong, everyone faces various level of stress either from work, family or schools. In fact, mood or stress-related disorders are so common in Hong Kong that they make up over 50% of all caseloads, or over 120,000 cases, in the psychiatric services under the Hospital Authority, are caused by stress, signifying the magnitude of the problem. To this end, the Hong Kong Special Administrative Region Government is committed to strengthening the mental health and mental well-being of the people in Hong Kong. The Department of Health had, in the past few years, carried out a mental health promotion and education programme called Joyful@HK to increase public engagement in promoting mental well-being, and to increase public knowledge and understanding about mental health. The Advisory Committee on Mental Health chaired by former Secretary for Justice Wong Yan-lung, is now planning to launch an ongoing mental health public education and promotion initiative next year. We hope that through more robust promotion and education, we can reduce stigmatisation towards persons with mental health needs with a view to building a mental-health friendly society in Hong Kong. There is scientific evidence that shows the causal relationship between good mental health and sports. And today’s event is definitely an example of how sports can upkeep one’s physical and mental health. I would like to express my warmest gratitude to Hongkong Land for bringing about this fun annual fixture for the 13th time in a row. I must also thank participants in this yearly iconic event on Chater Road. You all bring warmth, care and compassion and concern to those under mental stress. On this note, I wish the CENTRAL Rat Race 2018 every success and hope that all you rats enjoy your day and please help us spread the importance of mental well-being wherever you go. Thank you. Chief Secretary Matthew Cheung gave these remarks at the CENTRAL Rat Race 2018 on August 26. CityU’s (City University’s) new initiative in providing veterinary education in Hong Kong is indeed timely. According to the World Health Organization, 60% of existing human infectious diseases are zoonotic, and at least 75% of emerging human infectious diseases originate from animals. Issues such as virus and bacteria mutations, anti-microbial resistance and food-borne disease continue to present new challenges to the medical profession. These challenges are amplified by an increasing risk of disease transmission through cross-border travel and international trade, as well as rising population and density, placing even more pressure on public health. Good public health is the cornerstone of any safe and liveable city. This is particularly important for a dense city like Hong Kong with large numbers of people movement. Therefore, safeguarding public health is a top priority for my Government. We fully embrace the internationally advocated concept of “One Health” in planning and implementing our policies and measures to safeguard public health from a holistic perspective involving veterinary and medical professionals. Our respect for the One Health concept and our vigilance in public health have borne fruit. For well over a decade, Hong Kong has remained free from many globally significant and potentially deadly zoonotic diseases, most notably rabies, avian influenza and MERS (Middle East respiratory syndrome). But the recent local incidents of Dengue fever have reminded us of the importance of vigilance. As regards to the veterinary profession, Hong Kong has all along adopted an open regime, welcoming the best veterinarians trained in overseas universities to come to practice here. Undoubtedly, their contributions have helped to keep deadly zoonotic diseases at bay. But there is no room for complacency. CityU is now blazing a trail with the establishment of the College of Veterinary Medicine & Life Sciences to create a centre of excellence in veterinary and biomedical education. The college has launched Hong Kong’s first bachelor programme in veterinary medicine to build a local pool of expertise alongside that of overseas veterinary surgeons. The first cohort of veterinary students embarked on their journey last September. Training highly skilled professionals requires world-class academic and clinical facilities. To this end, CityU will establish a 12-storey One Health Tower as an educational and research base for veterinary medicine and life sciences to complement the college’s clinical facilities, livestock farms and veterinary diagnostic laboratory. I am sure that with CityU’s commitment to this new initiative, coupled with well-qualified academic staff and excellent teaching facilities, the college will produce graduates who measure up to veterinarians trained in other renowned institutions round the world. CityU’s vision and initiative would not have succeeded without the generous support from the Jockey Club Charities Trust. Naming the college as the Jockey Club College of Veterinary Medicine & Life Sciences is indeed appropriate. Looking ahead, the Jockey Club One Health Tower will not only provide the necessary space for students’ learning and research work, but will also serve as a platform for collaboration between veterinary and biomedical science under the One Health paradigm. It is also fitting that the Jockey Club will be a beneficiary of CityU’s initiative, as the graduates of the college would likely be amongst the targets for recruitment when you enlarge your own pool of veterinary expertise. So this is going to be a win-win result for all. 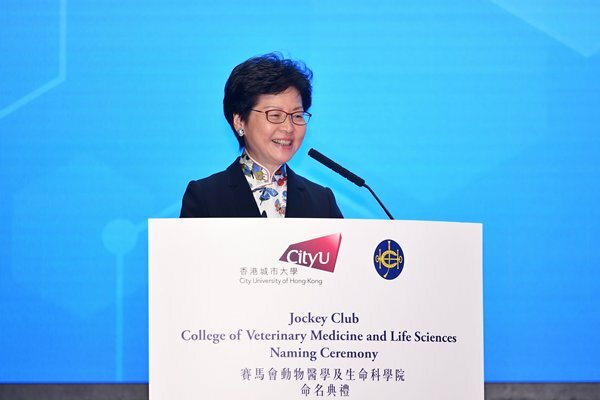 Chief Executive Carrie Lam gave these remarks at the naming ceremony for the Jockey Club College of Veterinary Medicine & Life Sciences of the City University of Hong Kong on August 20. Earlier this year when I attended the World Economic Forum at Davos, I was introduced to the inclusive development index, IDI, which was designed as an alternative to gross domestic product to reflect more closely the criteria by which people evaluate their countries’ economic progress. Such an analysis was prompted by the emergence of a worldwide consensus on the need for a more inclusive and sustainable model of growth and development that promotes high living standards for all. As a matter of fact, we have seen how slow progress of such and widening inequality have contributed to political polarisation and erosion of social cohesion in many advanced and emerging economies. In the midst of a divisive and polarised society, the well-being of families would be harder to safeguard. We have a good foundation to build on. Established in 2007, the Family Council has worked assiduously across bureaus and sectors to examine family-related policies and develop a loving family culture. With the efforts of the Family Council, Hong Kong today is a leader among Asian societies in applying family-impact assessments to policy-making. Indeed, including the family perspective as a factor in policy formulation has been a mandatory requirement for more than five years now. And soon all Government bureaus and departments will embrace an even more comprehensive checklist in assessing the impact of public policies on families. I’m sure Daniel, the current Chairman of the Family Council, will have a good deal more to say on this topic in his session tomorrow morning. Every policy that affects individuals and communities will also have implications for families. The United Nations has focused its major goals under the 2030 Agenda for Sustainable Development on the elimination of poverty and hunger, on promoting well-being for all at all ages, for improving work-family balance and achieving social inclusion. Allow me now to outline my Government’s work in these areas, all closely connected with family well-being. On poverty alleviation we have put in a lot of resources over the past few years. Spending on social welfare has surged by over 86% in the past six years, with a range of initiatives on social security pioneered by the Commission on Poverty, which I chaired during my time as the Chief Secretary for Administration, for some four years. And since I assumed the position of the Chief Executive, we have continued to find ways to improve those initiatives. One example is enhancements to the Working Family Allowance introduced earlier this year, with a view to benefiting more families and encouraging self-reliance. Dr CK Law, our Secretary for Labour & Welfare, will have more to say on this in his plenary session later this morning. On promoting well-being for all at all ages, we set up earlier this year a Commission on Children chaired by the Chief Secretary for Administration, which is an ongoing, action-oriented, responsive and high-level body that will drive the work for the benefit of children through policy formulation as well as co-ordination. Among its work priorities would be children with special education needs. In this connection, I have already announced in my Policy Address last year that we would regularise a pilot scheme which provides on-site pre-school rehabilitation services to children with special needs, and set aside funding to increase the service places with a view to achieving the policy objective of zero-waiting time, thereby alleviating the pressure on their families. At the same time, we will help families take care of their older members – an issue that will become more acute and challenging in the years to come because our elderly population is projected to increase markedly from 1.16 million in 2016 to more than double that by 2036. Last June, our Elderly Commission formulated its Elderly Services Programme Plan to help promote a sense of belonging, of security and worthiness, in our older generation. In my Policy Address last year, I announced a series of initiatives to enhance our community care and support services, including the provision of additional vouchers to support ageing in place for the elderly with moderate or severe impairment, while enhancing dementia care and support at the community level. Dr CC Lam, Chairperson of the Elderly Commission, will no doubt talk more about that in his plenary session on Wednesday afternoon. Good work-family balance contributes to quality family life. In this regard, our Family Council has been organising a biennial Family-Friendly Employers Award Scheme since 2011. I will leave it to Mr Lee Luen-fai, Convenor of the Sub-committee on Promotion of Family Core Values & Family Education in the Family Council, to tell you more about the diversified family-friendly employment practices being adopted in Hong Kong at his concurrent session tomorrow. I would only add that our Labour Department has been actively encouraging employers to adopt employee-oriented human resource management measures and family-friendly employment practices. In addition, my Government is working to increase statutory paternity leave, and is conducting a review on statutory maternity leave. As for enhancing social inclusiveness, we are committed to making Hong Kong a society in which people of all races, professions, ages and physical abilities live together in peace and harmony. Our efforts in poverty alleviation and enhancement of the welfare of children and the elderly that I just mentioned are all part of our endeavours in this regard. On top of them, my Government will continue to implement measures that promote the employment of individuals with disabilities, providing vocational rehabilitation and training services for them, and offering grants for NGOs to set up social enterprises. And we will not lose sight of the thousands of non-ethnic Chinese living in Hong Kong, including more than 80,000 South Asians. We are aware that some have encountered difficulties in adapting and integrating to Hong Kong society, largely because of language barriers and cultural differences. My Government is determined to ensure that they have equal opportunity and to accelerate their integration into our community. Indeed, in the enhanced Family Impact Assessment Checklist which all government officials will soon be required to respond to in policy formulation, there will be an explicit item to ensure that they respect, address and balance the needs, values and behaviour of families from diverse backgrounds. Ladies and gentlemen, what I have just mentioned shows that family-related work is multi-faceted. The Government would not be able to do it all alone. On the provision of social services, it is important to promote cross-sector and cross-profession collaboration as well as public-private partnership to make better use of our resources and provide more comprehensive care for the needy in society. In this process, we need a shared belief to drive actions. In this regard, the family core values as identified by the Family Council – “Love & Care”, “Respect & Responsibility” and “Communication & Harmony” will be guiding us through the way. 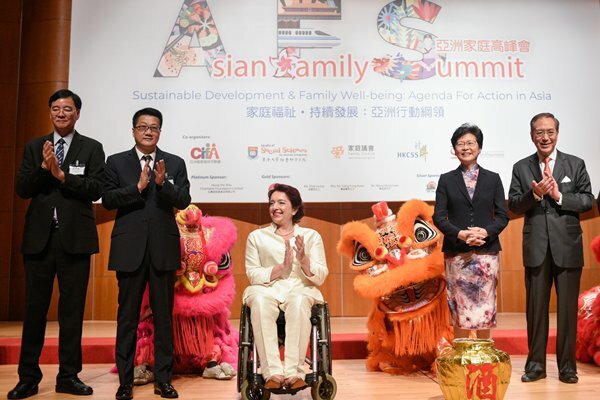 Chief Executive Carrie Lam gave these remarks at the opening ceremony of the Asian Family Summit on August 20.